Solar electric systems are appearing on more and more rooftops across America, but their pace of adoption has not been lightning quick. Why? The main reason may be the initial cost a homeowner must pay to get the system up and running. Despite government rebates for green home improvements, as well as the efficiency incentives offered by utility companies, a solar electric installation entails a considerably large investment. The other big hurdle has been aesthetics. Solar technology has gotten sleeker over time, but even those less-obtrusive panels are, in the eyes of many consumers, visually unappealing. Poised to change popular opinion on the matter, however, is a new product from Dow: the Powerhouse line of solar shingles. Rather than jutting out from the roof structure, Powerhouse shingles sit flush, hugging the pitch of the roof in a way that makes them largely inconspicuous to curbside passersby. Powerhouse shingles are the first solar product to be building code certified as a roofing material. “What this means,” says Dan Pezolt, commercial director at Dow Solar, is that these shingles serve “as the sole weatherization material on the portion of the roof where they are installed. 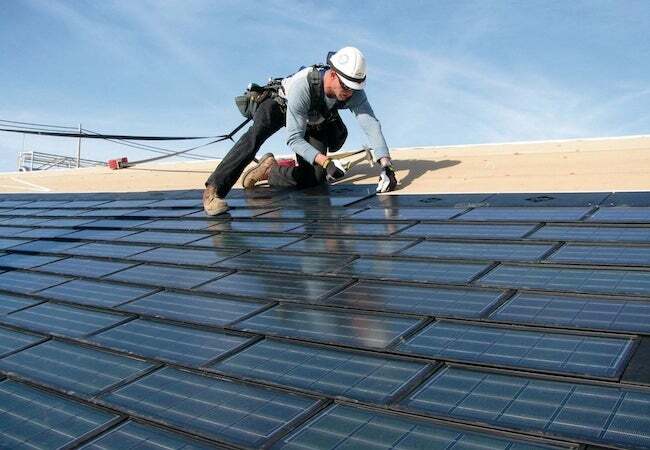 Previous solar roofing products have relied on underlayment materials to protect the roof from the elements.” In short, even though they help generate solar power, these shingles really are shingles. “requiring an electrician on the roof and preventing the shingles from lying flat. Or if the wiring was done below the roof deck, [electrical connections] required hundreds of penetration holes through the roof deck.” Because Powerhouse shingles are so similar to conventional ones, the average roofer can perform the installation. An electrician then handles the wiring, which includes integrating the solar roofing with the home’s electrical service panel. Suitable for any style of house, solar shingles take better advantage of roof area than do some other types of residential solar technology. 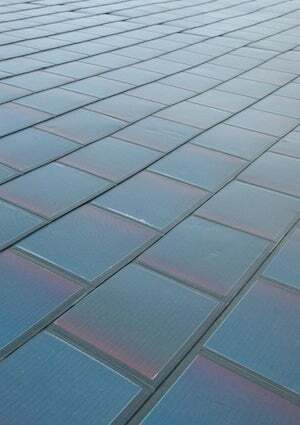 Whereas typically proportioned solar modules would be challenged by a roof valley, for example, such a junction wouldn’t pose a problem for solar shingles. The downside is that Powerhouse shingles are significantly less efficient than conventional modules. As a result, in order to output an equal measure of electricity, solar equipment must cover a greater portion of the roof. And solar shingles are not cheap; in fact, they cost more than the modules we’re used to seeing. For the portion of the roof you are shingling with Powerhouse, you don’t need to buy another roofing material. This is good news if you’re building from scratch or completely reroofing an older home. But if you have a roof that’s in decent condition, you’d have to remove perfectly good shingles to install the solar variety. If you’re wondering whether these shingles are a good bet for your house, here are some considerations to weigh. • At least 250 square feet of unshaded roof area is required for a typical degree of output. • A southern exposure is ideal for residential solar, but southeast and southwest are acceptable too. • Roof pitch needs to be taken into consideration; the ideal angle is equal to the local latitude. • The price of installation depends on your roof, your location, and the amount of electricity you wish to produce via solar. For a rough estimate of costs, consult the calculator Dow provides. Also, be aware that availability is currently limited to select markets, although it’s set to expand when the company opens a new plant in Michigan. Go here for an updated list of the states where Powerhouse shingles are available.